Moonlight has won Best Picture at the Oscars – but before that, La La Land was announced as the winner by mistake. Watch the flub below. 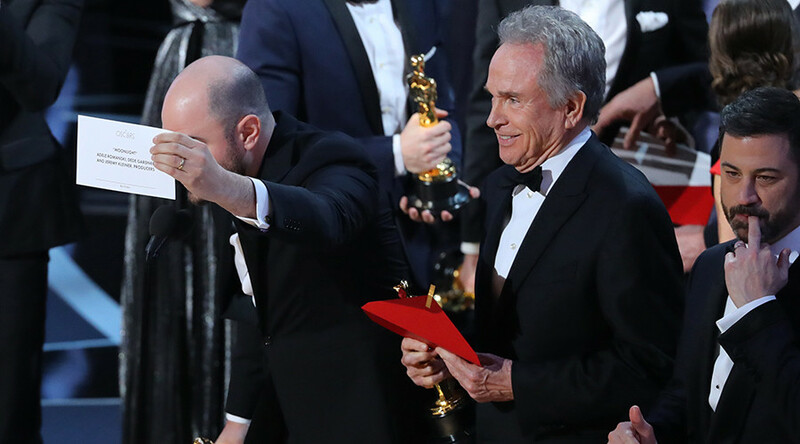 The cast and crew of La La Land were already on the stage to give their acceptance speech, when one of the producers, holding the envelope up to the camera, said that Moolight had actually won the award. Actress Faye Dunaway, however, quickly read the name 'La La Land. PricewaterhouseCoopers, which has monitored the Academy’s ballot-counting process for the past 83 years, issued a statement saying they deeply regret what happened. “We sincerely apologize to Moonlight, La La Land, Warren Beatty, Faye Dunaway, and Oscar viewers for the error that was made during the award announcement for Best Picture,” the statement said. La La Land went into the Oscars with a record-tying 14 nominations, eventually winning six, and making 32-year-old Damien Chazelle the youngest person to win an Oscar for Best Director. Emma Stone won Best Actress for her role in La La Land, while Manchester by the Sea’s Casey Affleck was named Best Actor. Viola Davis and Mahershala Ali were named Best Supporting Actress and Actor for their roles in Fences and Moonlight. Putin admits to #Oscars screwup. Moonlight also took home Best Adapted Screenplay, while Manchester by the Sea won Best Original Screenplay.